Even in ancient Roman architecture, podiums were used in arranging homes and public places. Today, with the help of the podium, many designers improve the proportions of space, and also divide the room into zones for greater functionality. The podium resembles a step, which, as a rule, has a height of no more than 25 cm. Of course, if necessary, the structure can be higher, but in this case it is made multi-tiered with a wide platform at the top. The podium can act as a decoration, while performing practical functions. 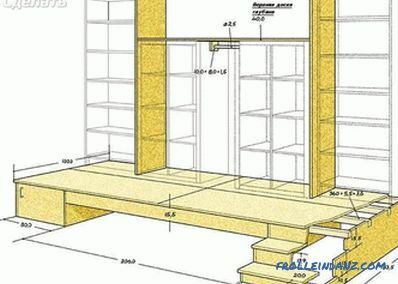 This article will discuss how to properly organize the space with the help of a podium, what materials it is made of, how to properly place this design, in addition, we will talk about the features of making a frame podium-bed. With the help of the podium, you can adjust, expand the usable area, place the communications, zone the room. It can be used as a piece of furniture and an additional source of lighting. Now let's talk about each value of the podium separately. Zoning of space. In accordance with the characteristics of human perception, those objects that are raised above attract more attention than those that are below. 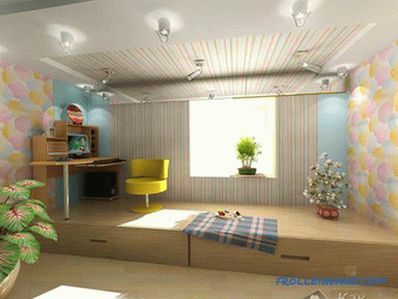 Part of the room, which is located on the podium, stands out, making the necessary emphasis in the interior of the room. Any functional area would be quite appropriate to look at the podium, whether it is for children or sleeping, office, kitchen or dining room. 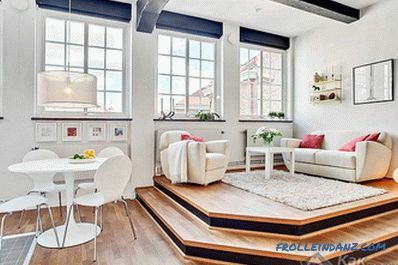 The use of the podium in one-room apartments and studio apartments is especially important. 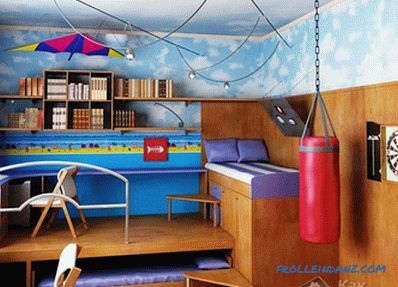 After all, they represent a multifunctional room. Correction of room proportions. Podium visually changes the perception of space. This result is achieved only with proper installation. Expand a narrow room can be a podium, rounded. The angularity of the square room is perfectly effaced with an angled podium. Placement of communications. In the podium, made on frame technology, you can easily hide communication systems, wiring cables and wiring for video and audio equipment. If you make a podium in the bathroom, then under it successfully hide pipes and other elements of engineering communications. Expansion of the useful area of ​​the room. It is possible to provide in the design boxes in which you can store things. This is a very significant detail in small apartments. Podium as an additional light source. A decorative lamp or LED strip of the appropriate color can be mounted on the end of the podium. The style of the interior will be successfully underlined with the help of lighting devices. Additional lighting will be made in the recreation area or in the guest part of the room. A podium that serves as furniture. Podiums often serve as a cozy bed or sofa. To do this, they are covered with foam rubber and draped with cloth. Thus, a regular bed can be replaced by a beautiful multi-layered structure. The berth can be put forward from a special niche of a design or be on top of a podium. 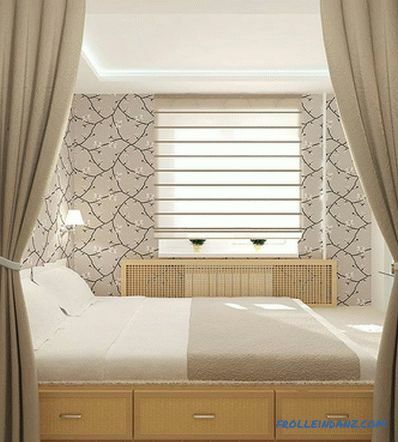 If you make a bed in a niche, then the upper part of the podium can be additionally used as you like. For example, as an office, home theater, living room or nursery. Make the podium not everywhere. Choosing a place for it, it is important to take into account some features of a particular room, and the design itself. The height of the ceiling in the room in which the podium will be made should be at least 2.75 m. Otherwise, the podium will look ridiculous, visually reducing the space. Center construction is unacceptable. First, it will be very inconvenient to bypass such a bulky podium. Secondly, he will be more like a rostrum for performing theater performances, due to which his initial appointment will be lost. The construction can not be constructed in the entrance area. The choice of a suitable place for the podium in many cases is determined by the configuration of the room. Its boundaries can be defined by arches, niches and partitions. In a narrow rectangular room, the podium looks great on the width of the wall. If the construction is made as a bed or for storage, then it should be installed in the place where the bedside or bed would fit. Round podiums give the room coziness and comfort. However, such designs are more difficult to furnish. Podiums are made of wooden frame or solid concrete.By the way, the frame is sheathed with one of the types of floor material. Each type of design has its undeniable advantages and disadvantages. Monolithic podium. Concrete is poured into pre-made formwork that will exactly repeat the shape of the finished podium. Then its surface is leveled with a screed. Then already laid flooring. This may be parquet, tile, carpet, linoleum, laminate, etc. Monolithic podium is incredibly reliable and durable. It does not rot, does not absorb moisture and is able to withstand heavy loads. 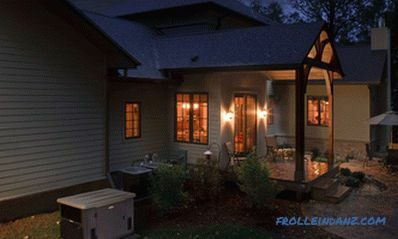 Its main drawback is its weight, because even a not very high structure creates a tremendous load on the floor. 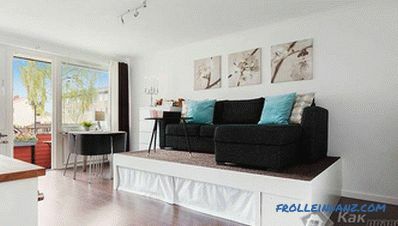 Monolithic podium can be made only in private houses, in apartments it will most likely damage the interfloor overlap. Frame wood or metal podium. The design is easy, so it does not load the overlap. This type of it is ideal for apartments. It is easy to install a frame podium with your own hands, which makes it possible to manufacture multistage structures without much effort. To improve the reliability and durability of the frame, it must be ensured that it is properly stiff. For this purpose intermediate lags are installed in the structure. Frame podiums can be constructed both in houses and apartments. The main thing is to choose the right source material for the frame and finish the finished structure. If the humidity in the room is high, the base is made of metal profile and sheathed its tile or wood-polymer composite. In rooms with a normal humidity level, the frame is made of wooden bars. Sheathed base multilayer plywood or OSB. If glued laminated timber is used as a log, then it must be pretreated with special anti-fungal impregnations and means protecting against fire. It is important for each city dweller to have his own corner where you can fully relax and unwind. This is due to the inexorably growing rhythm of life. A comfortable bed is often the main helper for a healthy rest. 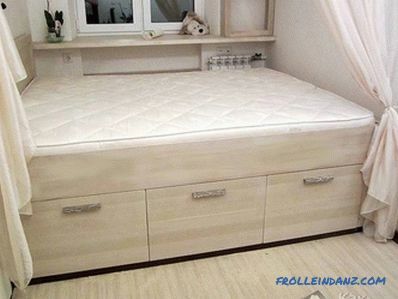 If you live in a small apartment, then you should not think that you will not have to sleep on a double bed. Previously, in small apartments, the only way out was to purchase a bed-book, but today this position is not the only one. 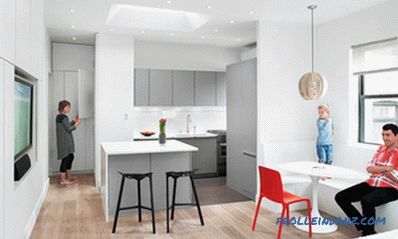 Nowadays existing technologies and innovations make it possible to achieve maximum comfort even in small rooms. Now the bed-podiums are replacing the book-beds more and more often. 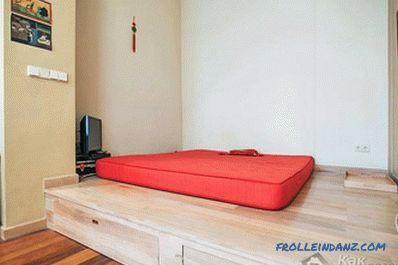 There are two types of podiums-beds. One of them is to build a podium and lay a double mattress on it. 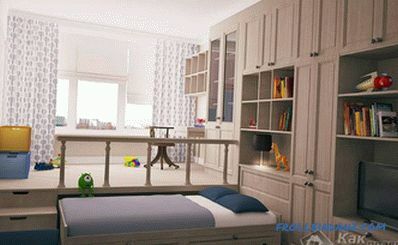 Thus, it is possible to arrange under the bed more spacious storage boxes, for example, bed linen, a spare blanket with pillows, toys for children, etc. The second type of podium is a platform and a retractable bed. On the site can be located office, games or even a kitchen. 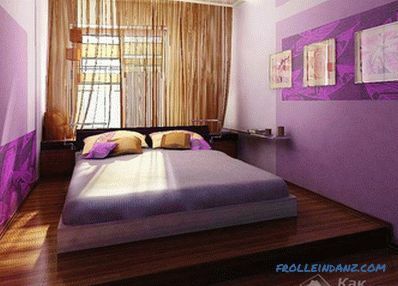 Thus, it is very easy to optimize the space, because during the day the bed will not disturb anyone. Roulette, pencil and long ruler. A construction stapler is useful if carpet is used as a podium finish. Materials and accessories are selected depending on the wishes. 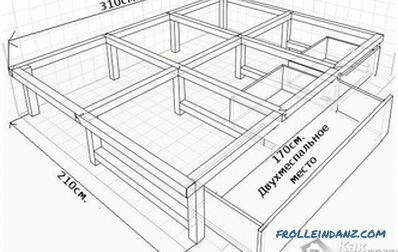 Now it is necessary to carry out the layout of the space for the future location of the bed-podium. The process is very similar to laying the wooden floor on the logs, with the only difference being that the mattress will lie on the surface of the podium at the final stage. The most economical option for a bed-podium will be a structure consisting of installed stable legs, a rectangular wooden frame with a worn chipboard sheet. Ultimately, a purchase mattress is laid on such a structure. 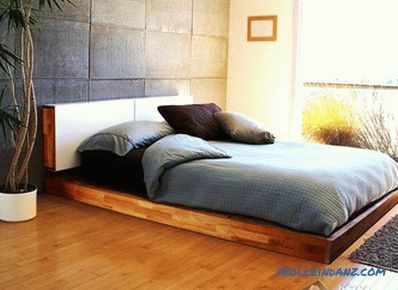 This type of bed is assembled in just a day! So, the chipboard should not be fixed easily on the legs, but on the perimeter made of boards. In accordance with the marking on the screws fastened timber. Such a simple frame will be the basis for mounting the legs. A cat bed with drawers is more expensive and more difficult to make. The process consists in fastening the timber around the perimeter of the structure with the subsequent installation of the boards.For the correct calculation of the dimensions of the podium it is necessary to consider the size of the room in which it is installed. The frame should be 5 cm higher than in the case of mounting a simple podium without drawers. The thickness of the board used should be 22 mm. 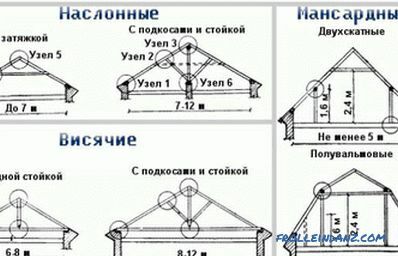 It will be required for the construction of the outer panels of the podium, as well as the transverse bar, which is installed in the center of the structure. In the production of internal parts of blocks used chipboard, having a thickness of 19 mm. The support frame is constructed from inside the block. Initially, it should be installed bearing bars, size 47 * 27 mm - they are installed horizontally, and after the support bars. To distribute the load on the support bars evenly, one of them is installed in the center, and two are placed at the edges. Fastening the bars is carried out with the help of screws. 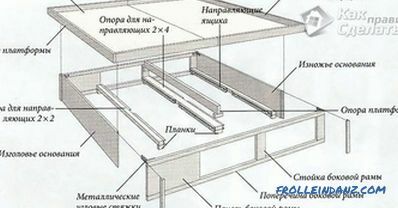 To make the drawers, you must purchase the required amount of board having a thickness of 16 mm Details should be prepared in advance, and then assembled. The bottom is made using plywood having a thickness of 10 mm. As for the sizes of the boxes, they must be calculated taking into account the internal space of the podium. Special glue is used to connect the parts. 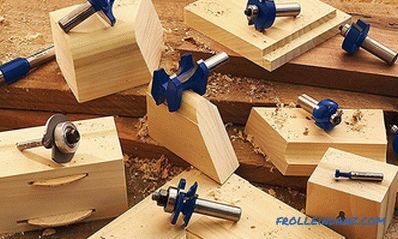 With the help of clamps, the design until the glue is completely dry. To make a retractable bed, you must first consider the retractable system, because it must withstand heavy loads. To do this, purchase guides and rollers. The frame is made without any special hitch, one might say, traditionally. The biggest snag in mounting a retractable bed. The podium, however, like the floor in the whole room, should be even . This is due to the fact that it will be installed furniture, and the design will have to go. Preliminary on the walls the height of the structure is measured. By applying the level (ideally laser, but the usual one will fit), a flat line is made along the walls of contact with the podium, which should correspond to the dimensions and height of the finished structure. For the manufacture of the frame, as in the cases described above, bar is used. Support bars are attached either to the floor or to the wall. It depends on the size of the podium, as well as the presence of niches. The design, which has a small size, as a rule, is anchored to the wall vertically. The structural strength directly depends on the distance between the uprights, the standard pitch is 40 cm. Now you can assemble the upper part of the frame. To do this, horizontal bars are placed on the racks, which are interconnected at an angle of 90 °. The joints can be fixed with metal corners. This is especially important in the construction of large-scale podium. The inner surface, in cases where it is not used for niches, should be filled with foam or mineral wool. These materials will serve as a good sound insulation. This will reduce the booming sound generated when walking in empty inner space. Examples of these processes can be viewed in the photo. 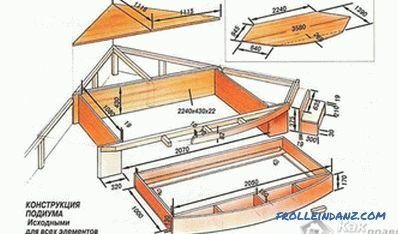 The frame of the frame must be strong, therefore it is used for this purpose sheet material of good quality. It can be gypsum fiber boards, boards, OSB or USB, sheets of plywood. 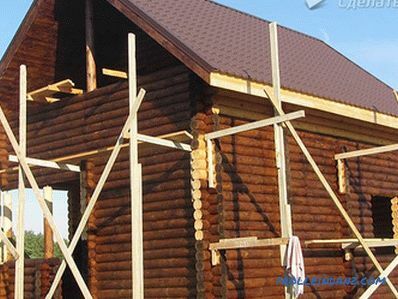 Sheets of cladding material are fixed with nails or screws. To prevent deformation of the surface when the cladding material expands, be sure to leave expansion joints that are 2-3 mm wide. In cases where internal space is used, the framework should also be sheathed on the inside. If there are no internal niches, then the end of the podium should also be sheathed. 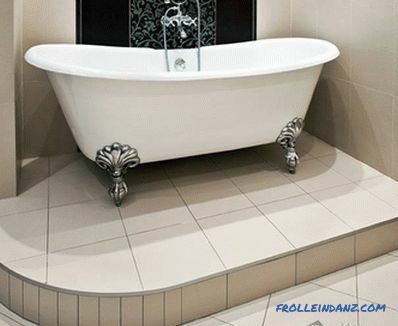 As for the finishing, it is carried out using a variety of floor materials. It can be parquet, carpet, cork, laminate, linoleum, tile, etc. The finishing process of the front part of the podium deserves special attention. It is sheathed in the same way as the top of the podium in cases where it has an even boundary. If it is undulating, then for the skin they use flexible material that is easily bendable. 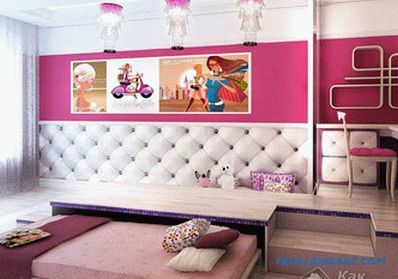 The use of flexible plywood, PVC plinth, metal profiles made of aluminum or brass, MDF panels is recommended. A bed is made in the same way as a drawer, the main thing is to maintain its exact size and correctly install guides and rollers. The quality of these moving elements plays a key role, so saving on their acquisition is extremely risky. After the production of the podium has come to an end, you should walk on it. This is done to assess squeaks and deflections. If there are defects, they must be eliminated. 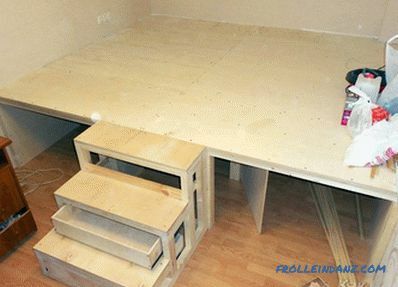 In cases where production processes are completed in the correct sequence, you can install the furniture. If you have questions on the topic, do not hesitate to ask them to specialists working on the site. Perhaps you used some advice? Then share how the material presented helped you. In any case, your comments will benefit readers.